I was really excited to read this book for a couple of reasons. First, it has a fantastic jacket description. Second, I’ve lived in Missoula, Montana for a year now, so I loved the idea of reading a novel set in my new hometown. Third, I love the jacket design–which sounds shallow, but there it is. Fourth, I’ve heard good things about the novel from a couple of people now. And yet … it hasn’t gone well. 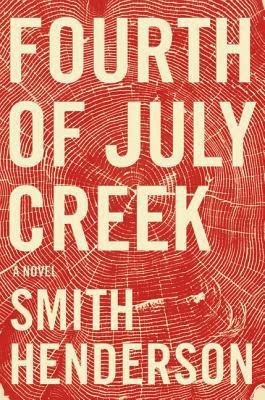 Fourth of July Creek is billed as a shattering exploration of America’s disquieting and violent contradictions. It is supposed to deal with the complexities of freedom and anarchy–and I can’t think of a better setting for this than Montana, where independence is not only valued but fiercely defended. These themes are meant to be reflected in the story of a social worker, Pete Snow, who gets tangled up with Jeremiah Pearl, a mysterious anarchist preparing for war in the backwoods of Montana. Pearl is a survivalist who believes the End Times are not just upon us, but already in motion. That would make a fantastic novel, and Henderson has the talent to pull it off. Fourth of July Creek crackles with dangerous energy whenever Pearl makes an appearance. The problem is, for more than two hundred pages his presence is merely hinted at. Instead, we’re treated to Pete’s sad-sack life. You see, Pete is in his early thirties and can’t seem to get his stuff together. His wife cheated on him, so he ran out on her and his daughter. Now he can’t decide if he wants his ex-wife back or hates her forever. And in a twist that could be interesting but only really grates, the social worker is an inept and apathetic father. He has a history of a drinking problem that is becoming more and more essential to his makeup. The guy is a mess. Most people might not have so much of a problem with this, but a curious thing has happened to me in the past year. I’ve become increasingly impatient with novels that essentially come down to “screw-up white guy can’t get his life together.”Because seriously, it’s incredible how many of those books exist in the world–and how they continue to multiply. There are so many more interesting stories that could be told (Jeremiah Pearl’s comes to mind). Add in the fact that Pete finds himself a love interest who comes down to the exact cliche you would expect for a guy like him. She starts out appearing strong and wise to his screw-up ways, then upon their second meeting inexplicably sleeps with him. Her actions make no sense because when it comes down to it the author doesn’t understand her and doesn’t want to understand her. So she’s left fluctuating between strength, weakness, and potentially violent emotional instability. Add to this the fact that the only other female characters (including Pete’s ex-wife) are harpies, nags, and emotionally immature. His daughter is an exception, I suppose–aside from the emotionally mature part. By the time I reached the novel’s halfway point I was exhausted. And it had become increasingly difficult to care. If Jeremiah Pearl’s story is going to be filtered through a character I find increasingly irritating, then why bother? So I put it down. Which is a shame, because I really think this had the makings of a great book. In addition, the narrative is curiously fractured. Pete’s narration is the focus, presented in the standard format. Then we have the tonally jarring narrative of his daughter, which takes the form of an interview. And gradually, the narrative of Cecil (one of Pete’s cases, who was sexually abused by his mother [did I mention that all women are horrible in this book?]) becomes a thing. Maybe it all comes together in the end, but two hundred and fifty pages is a long time to ask a reader to be patient.